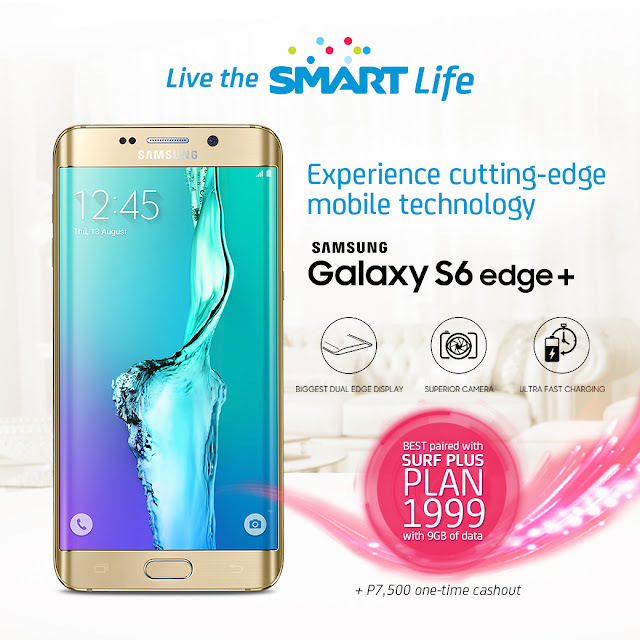 Leading mobile services provider Smart Communications, Inc. (Smart) has unveiled its unbeatable postpaid offers for the much anticipated Samsung Galaxy Note 5 and Galaxy S6 Edge Plus, aimed at giving you a much bigger Smart Life experience. 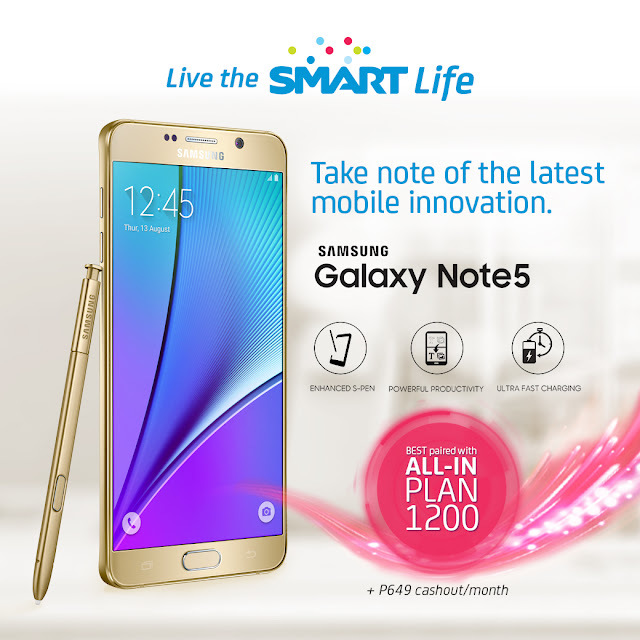 The Samsung Galaxy Note 5 is available under the fully consumable and customizable All-In Plan 1200, with a one-time cash-out of P15,576 or P649 per month via credit card under a contract of 24 months. On the other hand, the Samsung Galaxy Edge Plus is available under the feature-packed Surf Plus Plan 1999 under a contract of 24 months, with a one-time cash-out of P7,500. 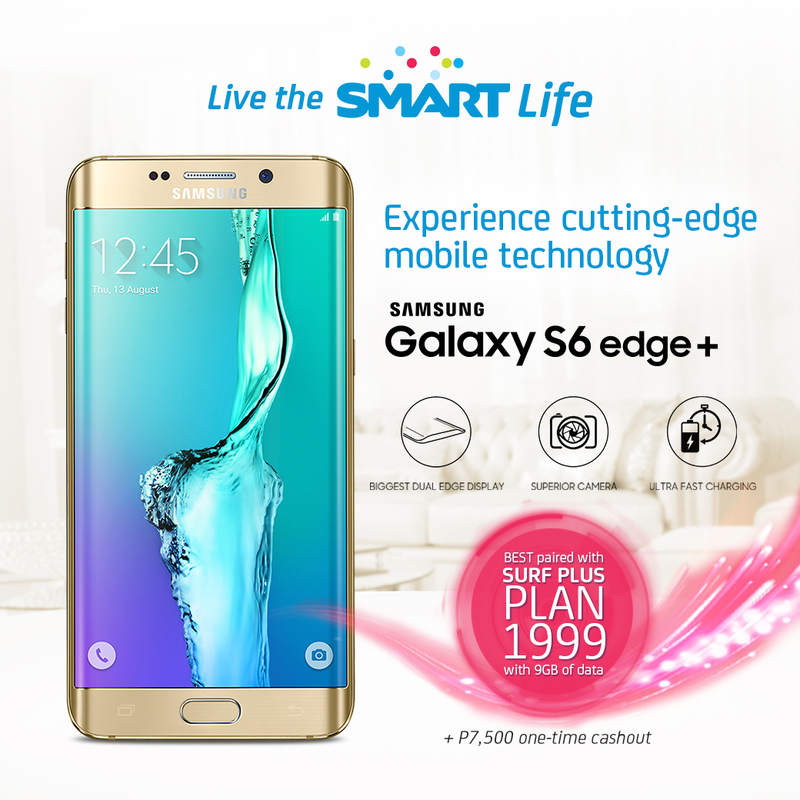 “Both the Galaxy Note 5 and the Galaxy S6 Edge Plus are the embodiment of style-meets-function-meets-cutting-edge technology, and you can make the most of their amazing features only with the country’s biggest and most advanced network,” said Kathy Carag, Smart Postpaid marketing head. With All-In Plan 1200, you can maximize the features of the Galaxy Note 5 by choosing from over 30 Flexibundles reflecting your passion, lifestyle and communication needs. For example, you can consume your All-In Plan 1200 by subscribing to Big Bytes 799 to enjoy 4.5GB data for all your surfing needs, as well as Trinet Plus 399, which gives you 500 minutes of calls to Smart, Sun, TNT and PLDT landline, and 2000 texts to all networks. On the other hand, you can optimize your Galaxy S6 Edge Plus with Surf Plus Plan 1999, which packs a supersized 9GB of data allowance, 150 minutes of calls and 200 texts to all networks, plus your choice of free app every month – be it Instagram, Facebook, YouTube, Spinnr, among many others. As an added perk, all new and recontracting subscribers for Plans 799 and above get a month’s subscription to the Smart Life Entertainment Bundle 299 for free. This gives them an additional of data for streaming their favorite movies and TV shows on Fox via Viewstream or iFlix, plus access to a host of apps like YouTube, Snapchat, Google, FBMessenger. The bundle also comes with 50 minutes of calls to Smart and TNT; and 500 texts to all networks – on top of the inclusions of their existing plan. Smart expects these latest Samsung devices to sustain its remarkable growth in the first half of the year as tens of thousands of new subscribers signed up to enjoy Smart Postpaid’s attractive device and content bundles, backed by the country’s widest LTE network. Unveiled during Samsung’s Unpacked Event at the New York Lincoln Center last Aug.13, both the Samsung Galaxy Note 5 and the Galaxy S6 Edge Plus feature a gorgeous 5.7-inch Quad High Definition screen, a 16-megapixel rear and 5-megapixel front camera, Dual-SIM feature and a 64-bit Octa-Core processor running the latest Android operating system Lollipop. Be the first to get hold of the Samsung Note 5 and Samsung Galaxy S6 Edge Plus by signing up at smart.com.ph/postpaid/phones/SamsungNote5. To stay updated on the latest Smart Postpaid offers, log on to smart.com.ph and follow Smart’s official accounts on Facebook (www.facebook.com/SmartCommunications) and Twitter (@SMARTCares) for updates.